On Wednesday it seemed that St. Patrick-St. Vincent High softball pitcher Taya de Alba had things to do, places to go, people to meet.De Alba made short order of the Piedmont High lineup in the first round of the North Coast Section Division IV softball playoffs as the sophomore hurler only threw 77 pitches and gave up just three hits in a 5-0 win for the Bruins that lasted just a shade under an hour and 15 minutes. St. Patrick-St. Vincent High School centerfielder Zaria Meshack makes a nice running catch of a deep fly ball in the top of the sixth inning of Wednesday's Div. IV North Coast Section championship playoff game in Vallejo. (Mike Jory/Times-Herald) all the other great pitchers in the league. 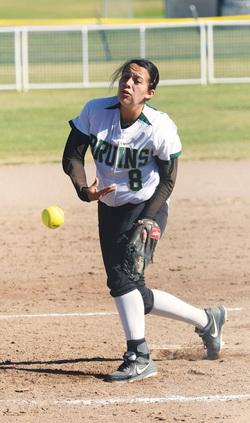 "De Alba didn't allow a hit until the fifth inning when Erica Paterson singled to left to begin the frame. When Amy Dong had a bunt single moments later, it was the only the first of two times a Piedmont runner would reach second base. The No. 11-seeded Highlanders fell to 15-11 with the loss. The Bruin sophomore said she and junior catcher Nicci Barker were seeing eye-to-eye all game long. "I never shake (Barker) off. I would never do that," de Alba said. "My curveball was really working today and the whole team played well together today. I had great defense behind me." Advertisement in St. Pat's first run on a single to left, the first of the catcher's two hits. Pinch-runner Tierney Bates scored the second run on an RBI groundout by Jaydee Boursaw, while de Alba drove in the third run on a single to left. De Alba also finished with two hits. "Getting runs early always helps but more than anything it helped the defense behind Taya," Gigliotti said. "They were able to relax and really play well behind her which we need because Taya isn't the type of pitcher that strikes a lot of batters out." The game remained 3-0 until the bottom half of the fourth when Jennifer Adams hit a two run single to left field to make the score 5-0. De Alba cruised the rest of the way and her only real scare came on a ball hit by Georgia Hill in the top of the sixth. With two outs, Hill's drive to center was caught at the fence by Zaria Meshack to end the inning. "At first I didn't know about that ball and thought it was a little shaky," de Alba said. "Then I saw Zaria get under it and I knew she had. Dot Bibb made a play like that last week in left so I have two great outfielders out there. It's like having heaven in the outfield." Bibb finished the game with two hits and a stolen base. St. Pat's will travel to No. 3 Cardinal Newman on Friday. Cardinal Newman won 15-0 over John Swett. First pitch is slated for 4 p.m.